High-precision location information is increasingly useful for mobile application developers, since it allows devices to interact with the world around them. 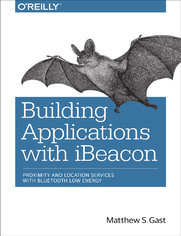 This practical book shows you how to achieve arm&#8217;s reach accuracy with iBeacons, simple transmitters that enable your applications to react to nearby surroundings and then deliver timely, relevant information&#8212;especially indoors, where GPS and cell service are inaccurate. Whether you&#8217;re enabling a map, giving users directions, creating a game, recommending purchases, letting users check in, or creating an immersive experience, you&#8217;ll learn how iBeacons provide precise location information, empowering your applications to engage and interact with users nearby.